A useful overview of how to read and interpret financial statements for non-accounting people, great for helping you know what to do with your money as an early stage founder. Understanding the foundation. Managers who are financially intelligent understand the basics of financial measurement. They can read an income statement, a balance sheet, and a cash flow statement. They know the difference between profit and cash. They understand why the balance sheet balances. The numbers neither scare nor mystify them. Understanding the art. Finance and accounting are an art as well as a science. The two disciplines must try to quantify what can’t always be quantified, and so must rely on rules, estimates, and assumptions. 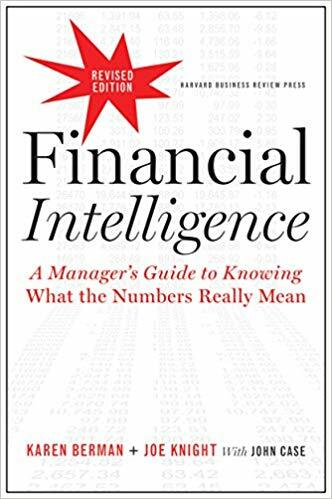 Financially intelligent managers are able to identify where the artful aspects of finance have been applied to the numbers, and they know how applying them differently might lead to different conclusions. They thus are prepared to question and challenge the numbers when appropriate. After reading this book, you should know a lot. So use it! Use it to improve cash flow. Use it to analyze the next big project. Use it to assess your company’s results. Your job will be more fun, and your impact on the company’s performance will be greater. The art of accounting and finance is the art of using limited data to come as close as possible to an accurate description of how well a company is performing. Accounting and finance are not reality, they are a reflection of reality, and the accuracy of that reflection depends on the ability of accountants and finance professionals to make reasonable assumptions and to calculate reasonable estimates. If you said, “When the product or service is delivered,” you’re correct. Income Statement: The income statement shows revenues, expenses, and profit for a period of time, such as a month, quarter, or year. It’s also called a profit and loss statement, P&L, statement of earnings, or statement of operations. Sometimes the word consolidated is thrown in front of those phrases, but it’s still just an income statement. The bottom line of the income statement is net profit, also known as net income or net earnings. an operating expense reduces the bottom line immediately, and a capital expenditure spreads the hit out over several accounting periods. Operating Expenses: Operating expenses are the costs required to keep the business going from day to day. They include salaries, benefits, and insurance costs, among a host of other items. Operating expenses are listed on the income statement and are subtracted from revenue to determine profit. Capital Expenditures: A capital expenditure is the purchase of an item that’s considered a long-term investment, such as computer systems and equipment. Most companies follow the rule that any purchase over a certain dollar amount counts as a capital expenditure, while anything less is an operating expense. Operating expenses show up on the income statement, and thus reduce profit. Capital expenditures show up on the balance sheet; only the depreciation of a piece of capital equipment appears on the income statement. More on this in chapters 5 and 11. Accruals: An accrual is the portion of a revenue or expense item that is recorded in a particular time span. Product development costs, for instance, are likely to be spread out over several accounting periods, and so a portion of the total cost will be accrued each month. The purpose of accruals is to match costs to revenues in a given time period as accurately as possible. Allocations: Allocations are apportionments of costs to different departments or activities within a company. For instance, overhead costs such as the CEO’s salary are often allocated to the company’s operating units. Depreciation: Depreciation is the method accountants use to allocate the cost of equipment and other assets to the total cost of products and services as shown on the income statement. It is based on the same idea as accruals: we want to match as closely as possible the costs of our products and services with what was sold. Most capital investments other than land are depreciated. Accountants attempt to spread the cost of the expenditure over the useful life of the item. Goodwill: Goodwill comes into play when one company acquires another company. It is the difference between the net assets acquired (that is, the fair market value of the assets less the assumed liabilities) and the amount of money the acquiring company pays for them. For example, if a company’s net assets are valued at $1 million and the acquirer pays $3 million, then goodwill of $2 million goes onto the acquirer’s balance sheet. That $2 million reflects all the value that is not reflected in the acquiree’s tangible assets—for example, its name, reputation, and so on. Balance Sheet: The balance sheet reflects the assets, liabilities, and owners’ equity at a point in time. In other words, it shows, on a specific day, what the company owned, what it owed, and how much it was worth. The balance sheet is called such because it balances—assets always must equal liabilities plus owners’ equity. A financially savvy manager knows that all the financial statements ultimately flow to the balance sheet. We’ll explain all these notions in part 3. Profit is based on revenue. Revenue, remember, is recognized when a product or service is delivered, not when the bill is paid. the top line of the income statement, the line from which we subtract expenses to determine profit, is often no more than a promise. Customers have not paid yet, so the revenue number does not reflect real money and neither does the profit line at the bottom. Now suppose you’re working for a fast-growing business services company. The company is selling a lot of services at a good price, so its revenues and profits are high. It is hiring people as fast as it can, and of course it has to pay them as soon as they come on board. But all the profit that these people are earning won’t turn into cash until thirty days or maybe sixty days after it is billed out! That’s one reason why even the CFO of a highly profitable company may sometimes say, don’t spend any money right now because cash is tight. Cash as presented on the balance sheet means the money a company has in the bank, plus anything else (like stocks and bonds) that can readily be turned into cash. Really, it’s that simple. Later we’ll discuss measures of cash flow. For now, just know that when companies talk about cash, it really is the cold, hard stuff. There is persuasive evidence that an arrangement exists. This just means the company is confident that a sale really did happen. Delivery has occurred or services have been rendered. What was sold is somehow delivered to the customer. The seller’s price to the buyer is fixed or determinable. The price must be known. Collectability is reasonably assured. You can’t count it as a sale if you don’t think you can collect. an income statement measures something quite different from cash in the door, cash out the door, and cash left over. It measures sales or revenues, costs or expenses, and profit or income. The Matching Principle The matching principle is a fundamental accounting rule for preparing an income statement. It simply states, “Match the cost with its associated revenue to determine profits in a given period of time—usually a month, quarter, or year.” In other words, one of the accountants’ primary jobs is to figure out and properly record all the costs incurred in generating sales. The costs and expenses on the income statement are those it incurred in generating the sales recorded during that time period. The matching principle applies to service companies as well as product companies. A consulting firm, for example, sells billable hours, meaning the time each consultant is working with a client. Accountants still need to match all the expenses associated with the time—marketing costs, materials costs, research costs, and so on—to the associated revenue. In principle, the income statement tries to measure whether the products or services that a company provides are profitable when everything is added up. Pro forma means that the income statement is a projection. If you are drawing up a plan for a new business, for instance, you might write down a projected income statement for the first year or two—in other words, what you hope and expect will happen in terms of sales and costs. That projection is called a pro forma. No matter whose income statement you’re looking at, there will be three main categories. One is sales, which may be called revenue (it’s the same thing). Sales or revenue is always at the top. When people refer to “top-line growth,” that’s what they mean: sales growth. Costs and expenses are in the middle, and profit is at the bottom. Remember that many numbers on the income statement reflect estimates and assumptions. Accountants have decided to include some transactions here and not there. They have decided to estimate one way and not another. Sales or revenue is the dollar value of all the products or services a company provided to its customers during a given period of time. Deferred revenue is money that has come in but is as yet unearned. So it can’t go into the income statement. Instead, accountants put deferred revenue on the balance sheet as a liability—that is, an amount that the company owes to somebody else. In the example, the airline owes you a flight. Cost of Goods Sold (COGS) and Cost of Services (COS) Cost of goods sold or cost of services is one category of expenses. It includes all the costs directly involved in producing a product or delivering a service. Above the Line, Below the Line The “line” generally refers to gross profit. Above that line on the income statement, typically, are sales and COGS or COS. Below the line are operating expenses, interest, and taxes. What’s the difference? Items listed above the line tend to vary more (in the short term) than many of those below the line, and so tend to get more managerial attention. Operating Expenses (Once More) Operating expenses are the other major category of expenses. The category includes costs that are not directly related to making the product or delivering a service. Operating expenses are often thought of and referred to as “overhead.” The category includes items such as rent, utilities, telephone, research, and marketing. It also includes management and staff salaries—HR, accounting, IT, and so forth—plus everything else that the accountants have decided does not belong in COGS. One more thing about COGS and operating expenses. You might think that COGS is the same as “variable costs”—costs that vary with the volume of production—and that operating expenses are fixed costs. Amortization is the same basic idea as depreciation, but it applies to intangible assets. These days, intangible assets are often a big part of companies’ balance sheets. Items such as patents, copyrights, and goodwill (to be explained in chapter 11) are all assets—they cost money to acquire, and they have value—but they aren’t physical assets like real estate and equipment. Noncash Expense A noncash expense is one that is charged to a period on the income statement but is not actually paid out in cash. An example is depreciation: accountants deduct a certain amount each month for depreciation of equipment, but the company isn’t obliged to pay out that amount, because the equipment was acquired in a previous period. Gross profit—revenue minus COGS or COS—is a key number for most companies. Profit is the amount left over after expenses are subtracted from revenue. There are three basic types of profit: gross profit, operating profit, and net profit. Each one is determined by subtracting certain categories of expenses from revenue. Other things being equal, a company with larger revenues can thrive with a lower gross profit percentage than a smaller one. Gross Profit Gross profit is sales minus cost of goods sold or cost of services. It is what is left over after a company has paid the direct costs incurred in making the product or delivering the service. Gross profit must be sufficient to cover a business’s operating expenses, taxes, financing costs, and net profit. Operating profit—gross profit minus operating expenses or SG&A, including depreciation and amortization—is also known by the peculiar acronym EBIT (pronounced EE-bit). EBIT stands for earnings before interest and taxes. What has not yet been subtracted from revenue is interest and taxes. Why not? Because operating profit is the profit a company earns from the business it is in—from operations. Operating Profit, or EBIT Operating profit is gross profit minus operating expenses, which include depreciation and amortization. In other words, it shows the profit made from running the business. Net profit is the bottom line of the income statement: what’s left after all costs and expenses are subtracted from revenue. It’s operating profit minus interest expenses, taxes, one-time charges, and any other costs not included in operating profit. . . .
That’s the thinking behind a particular form of profit known as contribution margin. . . . Contribution Margin Contribution margin indicates how much profit you are earning on the goods or services you sell, without accounting for your company’s fixed costs. To calculate it, just subtract variable costs from sales. Contribution margin shows you the aggregate amount of margin available after variable costs to cover fixed expenses and provide profit to the company. In effect, it shows you how much you must produce to cover your fixed costs. For example, a company should probably keep a product line with a positive contribution margin even if its conventionally calculated profit is negative. The contribution margin it generates helps pay for fixed costs. If its contribution margin is negative, however, the company loses money with each unit it produces. Since it can’t make up that kind of loss with volume, it should either drop the product line or increase prices. So what is the balance sheet? It’s no more, and no less, than a statement of what a business owns and what it owes at a particular point in time. The difference between what a company owns and what it owes represents equity. Just as one of a company’s goals is to increase profitability, another is to increase equity. And as it happens, the two are intimately related. What the company owns is called its assets. What it owes is called its liabilities. What it’s worth is called owners’ equity or shareholders’ equity. Whatever the format, the “balance” remains the same: assets must equal liabilities plus owners’ equity. Assets are what the company owns: cash and securities, machinery and equipment, buildings and land, whatever. Current assets, which usually come first on the balance sheet in the United States, include anything that can be turned into cash in less than a year. Long-term assets include physical assets that have a useful life of more than a year—usually anything that is either depreciated or amortized. Cash and Cash Equivalents This is the hard stuff. Money in the bank. Money in money-market accounts. Also publicly traded stocks and bonds—the kind you can turn into cash in a day or less if you need to. Another name for this category is liquid assets. Accounts Receivable, or A/R This is the amount customers owe the company. Remember, revenue is a promise to pay, so accounts receivable includes all the promises that haven’t yet been collected. Sometimes a balance sheet includes an item labeled “allowance for bad debt” that is subtracted from accounts receivable. This is the accountants’ estimate—usually based on past experience—of the dollars owed by customers who don’t pay their bills. “Smoothing” Earnings You might think that Wall Street would like a big spike in a company’s profits—more money for shareholders, right? But if the spike is unforeseen and unexplained—and especially if it catches Wall Street by surprise—investors are likely to react negatively, taking it as a sign that management isn’t in control of the business. So companies like to “smooth” their earnings, maintaining steady and predictable growth. Inventory Service companies typically don’t have much in the way of inventory, but nearly every other company—manufacturers, wholesalers, retailers—does. What you do need to remember as a manager, however, is that all inventory costs money. It is created at the expense of cash. In fact, this is one way companies can improve their cash position. Decrease your inventory, other things being equal, and you raise your company’s cash level. A company always wants to carry as little inventory as possible, provided that it still has materials ready for its manufacturing processes and products ready when customers come calling. Property, Plant, and Equipment (PPE) This line on the balance sheet includes buildings, machinery, trucks, computers, and every other physical asset a company owns. Maybe you work for an entertainment company that bought land around Los Angeles for $500,000 thirty years ago. The land could be worth $5 million today—but it will still be valued at $500,000 on the balance sheet. Sophisticated investors like to nose around in companies’ balance sheets in hopes of finding such undervalued assets. Goodwill Goodwill is found on the balance sheets of companies that have acquired other companies. It’s the difference between what a company paid for another company and what the physical assets of the acquired company are worth. Acquisitions An acquisition occurs when one company buys another. Often you’ll see in the newspaper the words merger or consolidation. Don’t be fooled: one company still bought the other. They just use a more neutral-sounding term to make the deal look better. . . .
Intangibles A company’s intangible assets include anything that has value but that you can’t touch or spend: employees’ skills, customer lists, proprietary knowledge, patents, brand names, reputation, strategic strengths, and so on. Most of these assets are not found on the balance sheet unless an acquiring company pays for them and records them as goodwill. The exception is intellectual property, such as patents and copyrights. This can be shown on the balance sheet and amortized over its useful life. liabilities, the financial obligations a company owes to other entities. Liabilities are always divided into two main categories. Current liabilities are those that have to be paid off in less than a year. Long-term liabilities are those that come due over a longer time frame. If your company owes $100,000 to a bank on a long-term loan, maybe $10,000 of it is due this year. So that’s the amount that shows up in the current liabilities section of the balance sheet. The line will be labeled “current portion of long-term debt” or something like that. The other $90,000 shows up under long-term liabilities. Accounts payable shows the amount the company owes its vendors. Accounts payable shows how much was owed on the date of the balance sheet. Any balance on a company’s credit cards is usually included in accounts payable. Accrued Expenses and Other Short-Term Liabilities This catch-all category includes everything else the company owes. One example is payroll. Deferred Revenue Some companies have an item called deferred revenue on their balance sheets. This is puzzling to the financial novice: how can revenue be a liability? Well, a liability is a financial obligation the company owes to others. Deferred revenue represents money received for products or services that have not yet been delivered. So it’s an obligation. Long-Term Liabilities Most long-term liabilities are loans. But there are also other liabilities that you might see listed here. Examples include deferred bonuses or compensation, deferred taxes, and pension liabilities. OWNERS’ EQUITY Finally! Remember the equation? Owners’ equity is what’s left after we subtract liabilities from assets. Equity includes the capital provided by investors and the profits retained by the company over time. Capital The word means a number of things in business. Physical capital is plant, equipment, vehicles, and the like. Financial capital from an investor’s point of view is the stocks and bonds he holds; from a company’s point of view it is the shareholders’ equity investment plus whatever funds the company has borrowed. “Sources of capital” in an annual report shows where the company got its money. “Uses of capital” shows how the company used its money. Preferred Shares Preferred shares—also known as preference stock or shares—are a specific type of stock. People who hold preferred shares usually receive dividends on their investment before the holders of common stock get a nickel. Dividends are funds distributed to shareholders taken from a company’s equity. In public companies, dividends are typically distributed at the end of a quarter or year. Retained earnings or accumulated earnings are the profits that have been reinvested in the business instead of being paid out in dividends. Net worth has to equal what he owns minus what he owes, because that’s the way we define the term. The first formulation of the “individual” equation in chapter 10 is owns – owes = net worth. It’s the same for a business. Owners’ equity is defined as assets minus liabilities. If Walmart consistently earns a 3 percent profit margin on annual sales of over $400 billion, that is a lot more money than a 30 percent profit margin on a business with $50 million in sales. While ratios are an important piece of the financial puzzle, you always need to put them in context to get the complete picture. Gross profit, you’ll recall, is revenue minus cost of goods sold. Gross profit margin percentage, often called gross margin, is simply gross profit divided by revenue, with the result expressed as a percentage. Gross margin shows the basic profitability of the product or service itself, before expenses or overhead are added in. Return on total capital (ROTC) or return on equity (ROE). ROE is the right metric for financial businesses such as banks and insurance companies. Most growth-oriented companies expand far more slowly; a growth rate of 10 percent a year, sustained over time, is remarkably good. (According to research by Bain & Company, only about 10 percent of global companies sustain an annual growth rate in revenue and earnings of at least 5.5 percent over ten years while also earning their cost of capital. The price-to-earnings ratio or P/E is the current stock price divided by the prior year’s earning per share. Historically, most businesses have traded in public markets at P/E ratios of roughly 16 to 18. Companies with higher ratios are considered to have high growth potential; those with lower ratios are considered slow-growth businesses. Investors often try to find companies with P/E ratios lower than the investor believes appropriate. At the end of 2011 both Apple and IBM had a P/E of about 14.6. If your company doesn’t break out percent of sales, try this exercise: locate the last three income statements and calculate percent of sales for each major line item. Then track the results over time. If you see certain items creep up while others creep down, ask yourself why that happened—and if you don’t know, try to find someone who does. The exercise can teach you a lot about the competitive (or other) pressures your company has been under. How should you interpret this? If the NPV of a project is greater than zero, it should be accepted, because the return is greater than the company’s hurdle rate. Here, the return of $350 shows you that the project has a return greater than 8 percent. Did you figure out the monthly cash flow return we will get on this new equipment? Eighty thousand dollars is a lot of money! Do you realize that we are in the spring, and the business is typically slow, and cash is tight during the summer? Have you figured in the cost of labor to run the machine? We are all pretty busy in the shop; you will probably have to hire someone to run this equipment. And are there better ways we could spend that cash to grow the business? Remember that ROI means return on investment—just another way of saying, “Prepare an analysis of this capital expenditure.” The boss wants to know whether the investment is worth it, and he wants calculations to back it up. Collect all the data you can about the cost of the investment. In the case of a new machine, total costs would include the purchase price, shipping costs, installation, factory downtime, debugging, training, and so on. Where you must make estimates, note that fact. Treat the total as your initial cash outlay. You will also need to determine the machine’s useful life, not an easy task (but part of the art we enjoy so much!). You might talk to the manufacturer and to others who have purchased the equipment to help you answer the question. Determine the benefits of the new investment, in terms of what it will save the company or what it will help the company earn. A calculation for a new machine should include any cost savings from greater output speed, less rework, a reduction in the number of people required to operate the equipment, increased sales because customers are happier, and so on. The tricky part here is that you need to figure out how all these factors translate into an estimate of cash flow, as we showed in chapter 27. Don’t be afraid to ask for help from your finance department—they’re trained in this kind of thing and should be willing to help. Find out the company’s hurdle rate for this kind of investment. Calculate the net present value of the project using this hurdle rate. Remember to use your finance department—they should have a spreadsheet that ensures you’ll gather the data they believe is important and that you run the calculations the way they want them done. Calculate payback and internal rate of return (the finance department’s spreadsheet probably includes those as well). You’ll probably get questions about what they are from your boss, so you need to have the answers ready. Write up the proposal. Keep it brief. Describe the project, outline the costs and benefits (both financial and otherwise), and describe the risks. Discuss how it fits with the company’s strategy or competitive situation. Then give your recommendations. Include your NPV, payback, and IRR calculations in case there are questions about how you arrived at your results. Chances are, the key numbers that you watch relate in some way to your company’s financial statements and hence ultimately affect its results. So start sharing those numbers with your team in weekly meetings. Explain where the numbers come from, why they’re important, and how everybody on the team affects them. Track the trend lines over time. Once that begins to occur, try taking it to the next level: forecast where the numbers will be in the coming month or quarter.